In my view, the two models compliment each other and both are worthy additions for any DX’er or listener. Each has its own set of useable and unique features. That said, 1970 is when I got my start in SWBC DX, either of these radios would have been among “the gold standards” at a time when Realistic DX-150s were $119.95 new, Hammarlund HQ-180s could be purchased new and Collins was still putting “winged emblems” on their amateur equipment. There were few consumer grade receivers which had frequency accuracy until the introduction of the Allied SX-190 at the princely sum of $249 but when tuning the 49MB in the evening, one heard the entire band on one frequency due to overloading. Oh well, I digress…. The Executive Satellit will be the 3rd from the Eton Satellit family I purchased. The first two were initial releases of the standard, black version; and both suffered from build quality issues and had to be returned. Some months down the road, I noticed that my friend, Clint Gouveia on his “Oxford Shortwave,” YouTube channel was demonstrating great success with his own Eton Satellit and with that in mind, I made what would become the 3rd plunge with Clint’s appreciated encouragement. My first operational impression of the Executive Satellit was that the overall build quality had been improved by an order of magnitude. The radio looks and feels good, responding well to control inputs although their placement on the PL-880 is superior to my way of thinking. On the Executive, I quickly found a feature different from the original Eton Satellit, the adjustable display backlight can be set to stay on indefinitely, even with the radio turned off and when the clamshell style leather case held in place by a number of magnets is folded over the front of the radio, the display is out of view and if left backlit, will result in a set of dead batteries over time. While on the subject of the Eton’s display, it is a major selling feature. The yellow-orange characters convey all the information a user might need with excellent resolution and the display is overall, pleasant to look at. A welcome change from LCD type displays more commonly found in portables today including the Tecsun PL-880. The Satellit uses 4 AA batteries (I recommend rechargeable, 2000ma Panasonic Eneloop batteries) while the Tecsun uses an included, single 16550 2000ma lithium ion battery. Both radios share the capability of being able to charge their internal batteries when connected to an included DC wall-wort power sources and additionally, in the case of the Tecsun, from a USB source. The Satellit uniquely allows the user to enter a charging time in minutes via the front panel keypad and the owners manual suggests charging times for batteries of various capacities. A nice feature. Each manufacturer stresses memory capacity as a selling point. Is a radio sporting 3,000+ memories better than a model with “only” 700? I suggest such a feature is a viable selling point only if the user can remember what is stored in each memory location. Both models help the user organize memory usage by organizing them in “pages” or banks. As an aside, I organize memory pages using a couple for local MW stations, and one for local FM. Pages 1-24 contain SWBC stations organized by time. Bank or page 1 contains SWBC stations that can be heard at 0100Z, page 2 at 0200Z and so on. A plus for the Eton, the user has the option of assigning an 8 character label to each page of seven memory channels which are accessible via a row of “F” keys, located just under the display. What about reception; what’s “under the hood?” Both have variable bandwidth, SSB, an external antenna input and fine tuning options. Using only the stock, attached whip antenna I was able to pick up Radio Havana, Cuba on 15370.0 although the PL880 suffered from picking up its own electronic spurs, seemingly a Tecsun characteristic noted across several of their models. Both radios received the station adequately but I’ll give a slight edge to the Satellit due to its slightly better audio recovery. Uniquely, the Satellit offers sideband selectable, synchronous detection but the resulting audio is on the muddy side and that feature is less than stellar. On FM, both were able to provide stereo reception of a 250 watt translator on 96.5 mHz located approximately 10 miles away with excellent, nearly identical audio quality. In as much as audio quality is judged differently by each of us, I will refrain from favoriting one radio over another. The ability to receive, decode and display RDS data is a plus for the Satellit. An aside, there is a well known MW-DX’pert who also chases FM DX. What does he use for a radio and antenna? How about a Sony 2010 and Tecsun PL-310? He puts each radio on an open frequency and waits for E-skip. No special, hi tech FM tuner or multi-element FM antennas. Point being, either of these radios have high performance FM tuners and are capable of delivering FM DX when there is E-Skip or Tropo-Ducting which speaks highly for both. As an Ultra-light DX’er since its inception, MW reception is important. Here again, performance between the two is was nearly identical although with their small ferrite internal MW antennas, don’t compete with say… a GE Super Radio II. Both the Eton and Tecsun benefit from an external, tuned, close- coupled MW antenna such as a Crate Loop. Unfortunately, the external antenna input on both is not operable on MW. Clearly, there is no “best” here, either choice is a good one; having both is perhaps the best option. 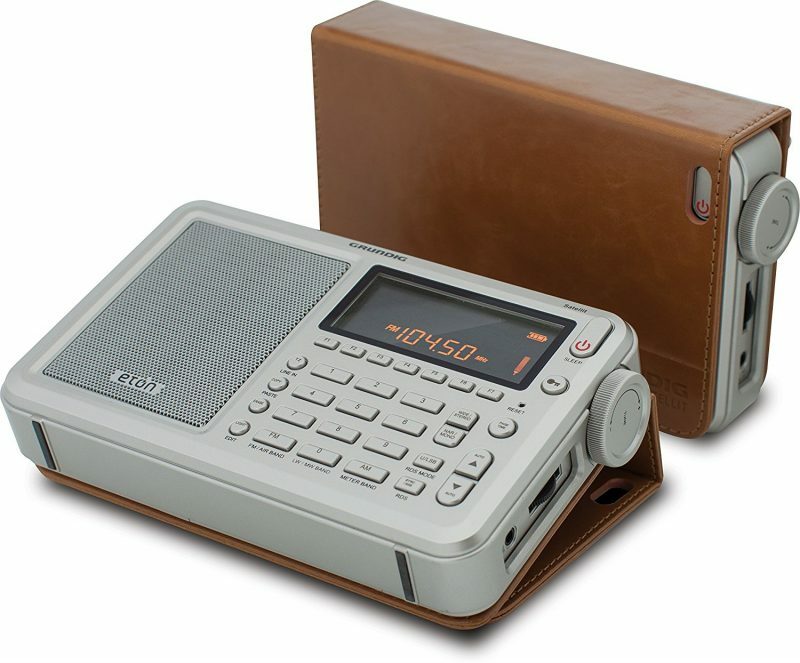 The performance of the Satellit and PL880 excel well beyond their price and make convenient traveling companions. A third of the size and half the price of what many consider “THE” benchmark portable multiband receiver, the Sony ICF-2010 or in Europe, the ICF-2001, both the Pl-880 and Satellit offer increased portability and compete closely with the Sony on performance and features. These attributes combine to deliver a sometimes rare commodity: VALUE ! I would challenge anyone to identify a current manufacturer, consumer grade receiver that offers the performance, features and audio quality of either these two receivers for under $250. All kudos aside, neither of these fine receivers will deliver the kind of gold plated performance delivered by a WinRadio, Drake R8B or Perseus, etc. Many thanks, Charles, for sharing your thoughts on these fine portables! FYI: I just checked and the Eton Executive Satellit is still $156.92 shipped via Amazon. This entry was posted in Guest Posts, News, Reviews, Shortwave Radio and tagged Chuck Rippel (K8HU), Eton Executive Satellit, Eton Satellit Review, Eton Satellit v Tecsun PL-880, Grundig Executive Satellit, Tecsun, Tecsun PL-880 on April 12, 2017 by Thomas. Excellent comparison videos, Chuck. What was being used as an antenna for these videos? This is not clear from the videos. The antenna was my sloper cut for the 90/60MB using my ham radio tower as a counterpoise, the lead in through a genuine John Bryant Common Mode Choke (which works miracles on noise) then into the external antenna input of the receivers. As an aside, I continue to be amazed at the capabilities of the less expensive Tecsun receivers such as the PL310et, PL-380, etc…. I have a PL-380 at my office and on a lark, tuned it to 15540.0 at 1830Z and copied the newly re-activated Radio Kuwait using only the $39 radios’ whip antenna. I did modify my PL-380. Kenwood uses a speaker with a polypropylene element in a couple of their hand-held land mobile radios. Same impedance and a perfect fit, it sounds a bit better to my ears. Much appreciated. Thanks for the comparison. This is a tough decision of which is “better”. The are both about dollars apart in pricing. Sometimes it is so close minor issues will make the decision like battery types or the way the leather case folds etc.